Japan Centre Timed Delivery Slots – Now Even Better! A couple of posts ago, we talked about the launch of our fabulous Home Delivery service. Fabulous though this service is, a lot of our customers found the name confusing. Most of Japan Centre’s online orders are delivered to customers’ homes, after all. Customers wondered made this new service so different. Therefore, we have rebranded, expanded, and are proud to announce the launch of Japan Centre Timed Delivery Slots, now bigger and better than ever! Normally, we use courier mail or the Royal Mail service for our deliveries. We have found that both services work fabulously well, but unfortunately neither delivers after traditional office hours, or allows customers to choose a specific time for delivery. We in the online hub received several requests for deliveries after office hours and within certain time frames. And since we are respected citizens and would never recommend that our customers miss a day of work to receive their orders, we decided to find a way to better cater to these customers. And thus, Timed Delivery Slots was born. Why choose Timed Delivery Slots? 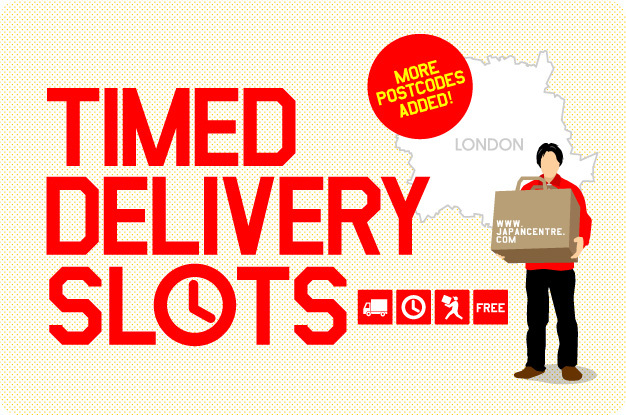 The Timed Delivery Slots service is the ideal option for customers who are not at home during office hours. Not only can you choose the time slot that suits you best, but your orders will be delivered to you by one of our friendly (and, we must say, ruggedly handsome) Japan Centre drivers. If you would like your items to be delivered on a particular working day, place your order by 9am on the previous working day (except bank holidays), and we will see that it is done! And the best thing of all? The price! Orders delivered by courier involve a fee of at least £4.99 per box, to cover the cost of delivery, packing materials, and the restraint our packers must exercise to not pop all the bubble wrap. But since home delivery service orders are packed into shopping bags and our bubble wrap need not be used, no matter how much you order the postage and handling fee will always be just £4.99! Better still, if you order over £100 worth, we will remove the delivery price altogether! 1. Choose the items you wish to order, and go to the check out page. 2. Fill in your delivery address. If your post code is in the London W3-W8 or W10-14 areas, the Timed Delivery Slots option will be shown on the following page (if your postcode is not in these areas, you might still be able to use Timed Delivery Slots – get in contact with us!). 3. Choose your desired delivery date and time slot (17:00 – 18:00, 18:00 – 19:00 or 19:00 – 20:00 Monday to Friday, except bank holidays). Follow the instructions and complete the check out. 4. Wait impatiently on your expected day of arrival for your driver to call you, to tell you they are on their way. 5. Make sure somebody will be in the house to accept your order. Awesome! But surely there must be a catch? If we are experiencing stock shortages we may not be able to deliver at your preferred date/time. Time slots are allocated on a first come, first serve basis. If your preferred time has already been chosen you will have to choose another convenient time. Our driver will contact you on the day of delivery, so please provide a telephone number that you will definitely have to hand. All in all, not too painful. Or at least, we like to think not. Interested? Keen to learn more? If so, feel free to comment on this post, contact us by phone (0203 405 1151) or send us an email (enquiry@japancentre.com). Posted in Uncategorized and tagged Books, Gifts, Magazines, manga, Toys. Bookmark the permalink.